Walk with people in Zurich and Hong Kong simultaneously, play music with colours or move in a remote space. Play, test and experiment with us in the two labs. 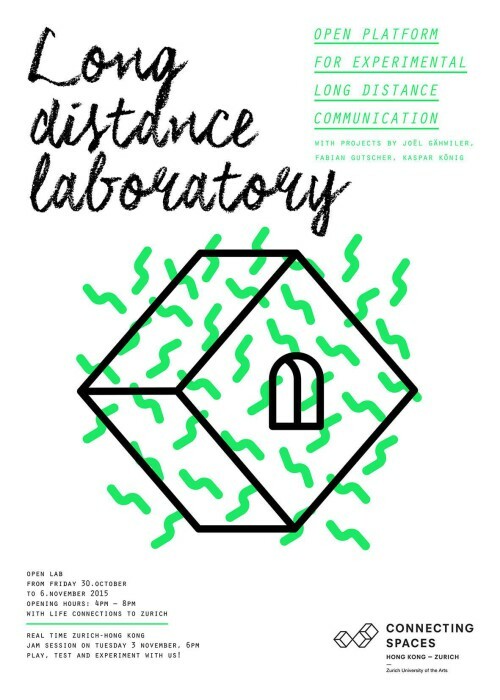 The “Long Distance Laboratory” is an open platform for experiments researching new ways of interconnecting physical spaces and increase collaboration with new communication tools. Designers and artists meet and experiment together by building installations that research these ideas and create a dialogue between remote spaces. Open workshops support the experiments and invite the public to join the discussions. As the event is taking place in Zurich and Hong Kong at the same time, the experiments are heavily linked to the other remote space. Kaspar König will connect multiple sound generators to the tunnel. There will be RGB webcam input from both sides. The input will be translated by the webapp www.synestizer.com into sound, which will be played in both sides. The rooms can now „interact“ through colours and sounds with each other. Further ideas are augmenting the online application with some haptic input devices. The Synestizer is a web-app that allows the generation of music from camera video input and is open source available at Github. Kaspar König is research assistant at the ZHdK with a focus on transdisciplinarity. Fabian Gutscher will try to synchronize the walking of people in the connected spaces and research the creation of a connection that is merely receivee as unconscious and automatic. The project is about social choreographies and the communication on the level of bodies and movements. The Synchronisator-app allows the de-/synchronization of movement between multiple people at different locations. The “Moving Object I“ looks similar to a bug, and carries two tactile transducers, which transmit slow sound waves, as well as a set of pencils, which are attached to its bottom. The vibrations of the tactile transducers make the object move, and by doing so the object leaves traces on the floor. Stereo signals will be sent from Hong Kong to Zurich and the other way round, making the objects move and paint in both spaces. The „Moving Object II“ uses a computer program analysing sound power and translating the corresponding signals into a rotating movement of a light object. Audio signals sent from Zürich will make the object move in Hong Kong. Fabian Gutscher is doing a master in transdisciplinarity studies at the ZHdK and is part of the Transcultural Collaboration program taking place in Hong Kong. Joël Gähwiler will build a modern version of the phone box, using Oculus, that brings the callers into a virtual space that bridges the physical distance and allows face to face communication. The project Physical Terminals is an investigation of the Tunnel Project (http://tunnel.connectingspaces.hk/) as a series of tools that connect spaces and people not only based on speech. Joël Gähwiler is teaching assistant in Interaction Design and working on the development of a virtual tunnel as a means for connecting physical spaces.